A native of Seoul, Korea, Choong-Jin (C.J.) 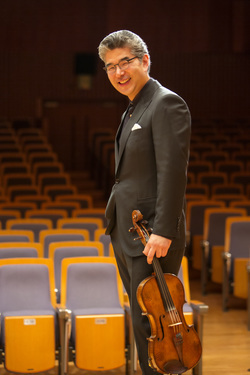 Chang became the Principal Viola of the Philadelphia Orchestra in 2006 after serving the same orchestra for 12 years. He made his performance debut as a 12-year-old violinist with the Seoul Philharmonic as winner of the grand prize in Korea’s Yook Young National Competition. In 1981, at the age of 13, he moved to the United States to attend the Juilliard School of Music. He subsequently studied in Philadelphia at the Esther Boyer College of Music of Temple University and at the Curtis Institute of Music, from which he received degrees in both violin and viola. His primary teachers were Jascha Brodsky and retired Philadelphia Orchestra Principal Viola Joseph dePasquale. Since Mr. Chang made a successful solo debut recital at Carnegie Hall in 2007, he has appeared in numerous recitals in United States and South Korea. He made the Philadelphia Orchestra subscription debut as a viola soloist in 2009 and appeared again as a soloist in 2012. Last year, Mr. Chang planned the Bach and Hindemith Project which included all nineteen pieces from both composers and performed successfully in four recitals over a year. As a chamber musician, Mr. Chang performs with world’s great musicians at many prestigious festivals throughout United States and Asia. Alongside his extensive performing activities, Mr. Chang is a respected teacher on both violin and viola. Among his former pupils are current members of the Philadelphia Orchestra and the Cleveland Orchestra, as well as many winners of major competitions. He currently serves on the faculty of Rutgers University’s Mason Gross School of the Arts and John Hopkins University’s Peabody Conservatory of Music.